The Philippines is the fourth most disaster-prone country in the world having 274 disasters in ten years, from 1995 to 2015 . It is a country where extreme events – protracted, recurrent and sudden – can wipe out gains built over years, even decades. “A typhoon can be especially devastating to farmers. Without their harvests, it is easy for them to go into a cycle of debt,” said Hazel Tanchuling of Rice Watch and Action Network (RWAN). A third of the country’s workforce is employed in the agriculture sector, but it is a job that is increasingly defined by risk and low returns. In a year, up to 20 typhoons may visit the country. As part of the overall rehabilitation efforts after Typhoon Haiyan, RWAN and the Panay Rural Development Center, Inc. (PRDCI) are working to increase the capacities of farming communities in managing the risks they face. Both RWAN and PRDCI are partners of Christian Aid in the Philippines. Through the Climate Resiliency Field Schools (CRFS), they seek to sustainably improve the ability of farmers to adapt to climate change and their livelihoods to thrive despite a disaster-prone environment. Weather stations are set up in partner municipalities for localized weather information that farmers and fishers can regularly access. Farmers’ field schools are also held to introduce adoptive and sustainable farming technologies and practices, such as System of Rice Intensification (SRI). At present, RWAN has partnered with LGUs and PAGASA in implementing CRFS in 32 municipalities. These institutions are mandated and responsible to provide services to communities. Rebecca and Janny Panolin were one of the CRFS participants in Batad, Iloilo province. “We were able to help and support one another better in managing our farm. 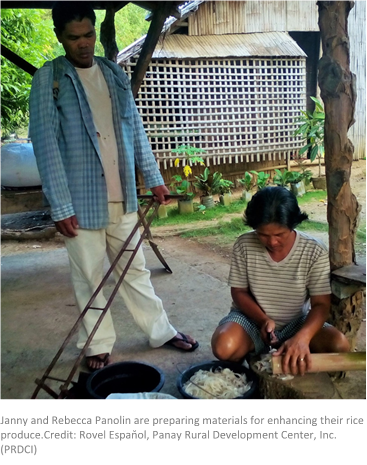 We both learned about the SRI (System of Rice Intensification) technology,” said Rebecca. At the end of the cropping period, 135 kgs or 3.2 cavans of palay was harvested from the Panolins’ 100 square-meter farm, said Chito Tionko, PRDCI Executive Director. This translates to about 13.5 tons per hectare, more than what they have ever harvested from their plot of land. But what made this a truly stunning achievement was the use of less water, less seeds, less fertilizer, and no agrochemical crop protection. The SRI technology leads to better yields by improving the soil ecology and increasing beneficial soil organisms, said Tionko. “When we are not in the farm tending the crops, you can see the two of us together preparing the organic inputs we need,” said Rebecca. To further improve productivity and food security, the couple also learned about farm diversification so that if one crop fails, there would still be a back-up. They also learned to use weather information in their decision making and farm planning. The principles of the System of Rice Intensification (SRI) were developed to increase yield and improve the rice production through improving the soil environment and tapping plants’ growth ability with less reliance on inorganic nutrient inputs and varietal change. Efforts like these are supportive of Core Responsibility Four which commits to a decisive shift from delivering aid to ending need. The project starts at the local level, which is where any intervention that seeks to address people’s vulnerabilities must begin. Its goals are resilience, capacity-building, self-reliance and, consequently, less dependence on foreign aid and external assistance. Local leadership is supported and local government staff are also engaged. The collaborative approach brought together the expertise of government and two of Christian Aid’s partners – RWAN and its climate risk management, and PRDCI and livelihood resilience – resulting in outcomes better than could have been achieved by any organization acting alone. At the core of Christian Aid’s strategy in the Philippines is linking humanitarian response to long-term goals. In the context of the Philippines, this is crucial in addressing the root causes of vulnerability of communities, such as poverty, conflict and threats to land rights. In line with the direction set out by the UN Secretary General’s Agenda for Humanity, Christian Aid in the Philippines renews its commitment for a decisive shift in the humanitarian system: from delivering aid and individual projects, to ending need and addressing the roots causes of people’s vulnerabilities. *With reports from Rovel Espaňol, PRDCI Volunteer Agriculture Technician; Chito Tionko, PRDCI Executive Director; and Hazel Tanchuling, Rice Watch Action Network (RWAN). 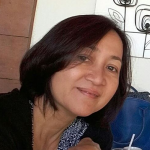 Josephine Matriano is the Programme Manager for Haiyan at Christian Aid. Prior to her current post, she was the focal person in the Philippines for the DFID-funded resilience projects in indigenous peoples and mining-affected communities and urban poor communities. Her expertise include community-based DRR, advocacy, and Emergency Food Security and Livelihoods (EFSL).